A tale of two sisters, separated by distance but united in their love of all things crafty. And that whole sisterhood thing. The ghosts of past, present, and future projects haunt this sidebar. 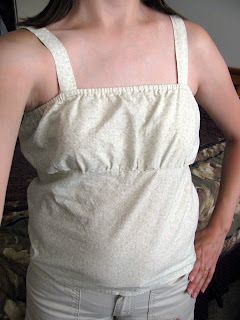 Cut and re-hem a dress to turn it into a shirt. 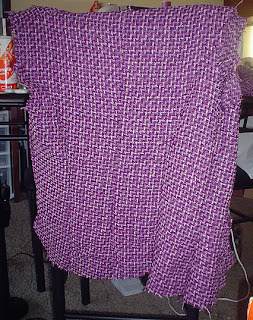 Quilt for Simon with old clothes. Power to the Stitchers and Bitchers! Oh wow! It's an update! Okay people. Here's the thing, I've started sewing again. Not exactly knitting (or knit fabric), but it's a start, right? I'm doing something with needles. The first thing I've made recently is a top for summer. It took me a good few days to make it since I wasn't using a pattern and had to keep tyring it on to make sure it fit well enough to wear in public without flashing anyone. Fun. 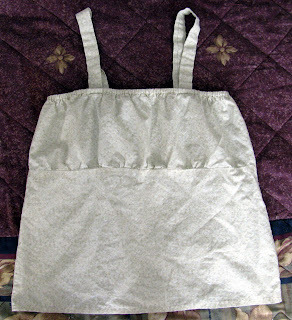 Now, the skirt (that I've dubbed the 3 ,2 ,1 Skirt) is a three tiered skirt. 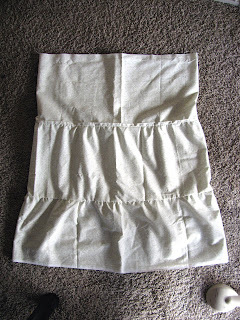 It's composed of three strips of fabric (hence the 3 part of the name) that are cut at three different lengths. 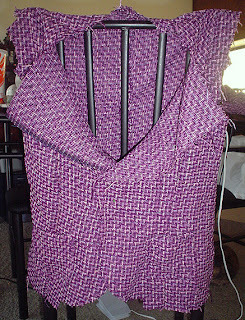 When sewn together, the tops have been basted so that it can be bunched to fit the bottom of the piece above. The 2 part of the name is because I started it yesterday afternoon and will be finishing it today - 2 days to make it. This probably won't be true the next time I make one of these since I could have been done with it yesterday had I not sewn a piece on wrong side out. Go me. The 1 part of the name is because it's one skirt. Creative, huh? Don't sprain yourself rolling your eyes too hard. I cannot take credit for coming up with this skirt. I originally got the idea from my best friend's mom about 5 years ago. The one I made then doesn't fit me right now because I've had two kids since then. Someday, though. This skirt, however, with the elastic at the waist, will fit even after I've lost the weight because the design is so awesome. 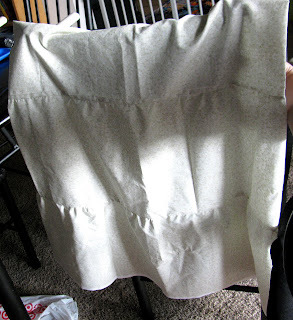 I've taken pictures of the skirt so far since all that's left to do is the bottom hem and finish the top with elastic in the band. Note: It has not been ironed yet. 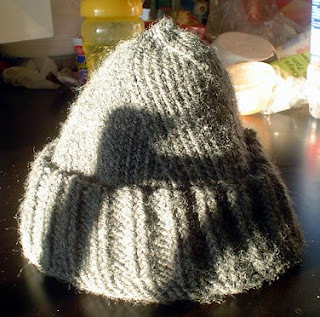 Just though I'd actually throw in something knit, so I'll share with you the beanie I made for my older son last year. It's knit and it's the second beanie I've made without the Knifty Knitter. Yay for not being lazy! Below are more pictures of it and a picture of my son modeling it the few seconds he actually kept it on. He's worn it a bit more since then (and for longer periods of time), but right now it's summer and there's no way I'd make him wear it in this heat. I don't remember how long it took me to make it. Since I was working at the time, it was longer than it should have been (a month?). And if you look to the picture at the left, you can see a swirl. That was actaully an oopsie that turned out cooler than I thought. Instead of the usual 6 decreases in a given row, I did 5. So, my mistake is your new technique if you want to add a little extra to your beanie. Tell your friends. And, yes, the brim is an alternating k2, p2. How original, huh? Notice anything missing from the "On The Needles" section? I have finished my jacket. After three weeks of working on it, it's finally done! So, without further ado, here are pictures of the finished product. So, there you have it. 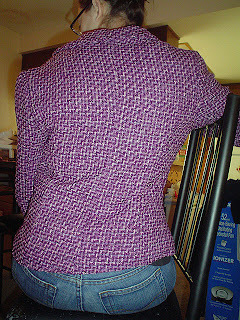 My first jacket. Not bad considering. And just in time for Thanksgiving. Labels: el fin, jacket, pretty, sewsayswhat? Before I go into what the title is all about, I just want to let you know how the jacket is coming along. I'm almost done. 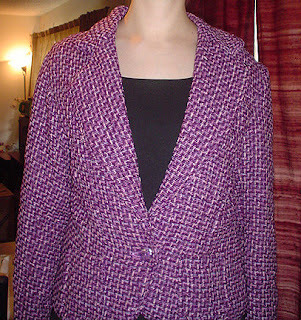 I just need to do the sleeves of the lining, attach the lining to the jacket, finish the collar, do final hemming and attach the button(s) (I might put two instead of one like the pattern says). I've been sick, so I haven't been feeling up to doing much of anything other than sleeping. Bleh. So, on to the actual subject. I was looking for some holiday present ideas since I'm poor but I have toooons of yarn to make stuff when I came upon this awesome site. The picture to the left will take you there if you want. It's called Vintage Purls. 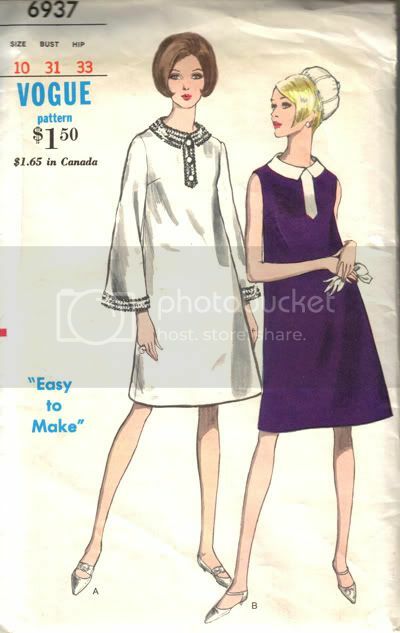 They had some awesome clothes to knit back then. You just don't see that kind of quality nowadays. . .well, you do, but it's rarer than it was then. And they have patterns for men, babies and children. How cool is that? Apparently, there's more than one vintage site out there. I did find some more. You could, too. 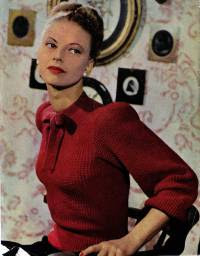 Just do a search for vintage knits. 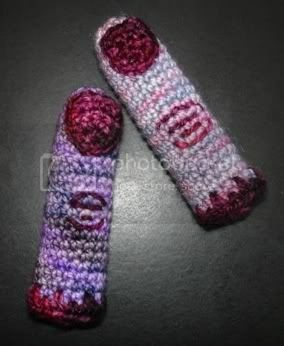 I accidently stumbled onto these searching for "holiday knit ideas." See? Accidents can be beneficial. I'd love to try and make some of the articles listed on Vintage Purls, but my project list is so long and I need to come up with some Christmas presents for family that I probably won't be able to start anything until after the big holiday season (mid-January if I'm lucky). Well, I hope you enjoy the site as much as I do! You're welcome. 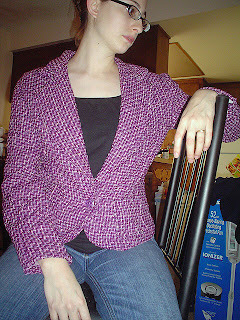 So, I finally decided I wanted to finish a jacket that I had gotten all the fabric and notions for TWO years ago. All the pattern pieces had been cut out (something that had been done earlier this year with my new post-baby measurements) so this last week I cut out all the pieces and started sewing. You can see what it's supposed to be in the On The Needles section to the right. Not bad so far, if I may say so myself. When it's all done (and when I'm happy with it) I'll post the final pictures. Fun stuff! They're all purple and rotting! It's neat! What's even cooler is that the pattern for these babies is totally free, so you can click here to bookmark it and/or print it and start leaving these in inconspicuous places. For example, an ashtray at a friend's house or bar -- wait, they don't smoke in our bars anymore. But an ashtray somewhere. Or, if you were riding in someone's car, just casually leave one or two in a cup holder. I highly recommend leaving some strewn in a baby's crib for laughs, though you might want to do it when baby isn't in it because I don't want you blaming me if baby eats it or something. The possibilities are endless, so always keep a steady supply on hand (har har). You never know when you'll need an extra, rotting finger. Yay! The second half of the genius is finally here! Anyhoo, this is just and introduction. I am a stay-at-home mom. That means I have time to work on stuff, right? WRONG! I have a very active 10 month old (he can walk and climb). I have a very long list of projects including several pairs of slippers, two beanies, a scarf, a blanket and many more. 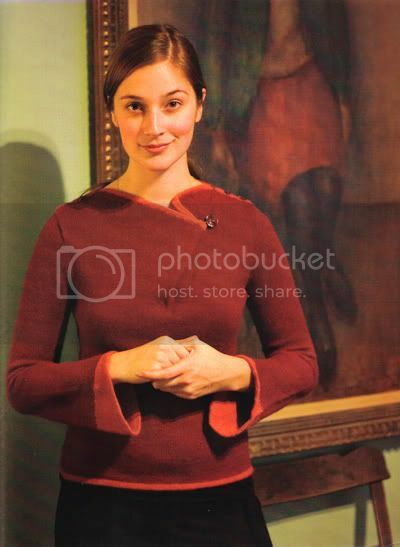 I'll try and post pictures (PhotoBucket is being retarded right now) and put a complete list in the sidebar. 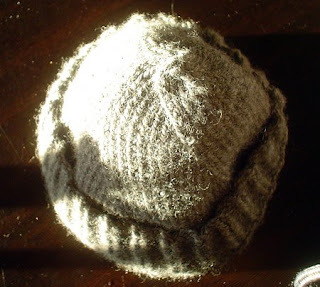 I haven't actually updated my profile, so check back later to get and the knitty gritty details. My first thought upon seeing this trim little jacket? "Your grandma's going to be so pissed you turned her couch into a jacket." I understand the appeal of upholstery fabrics, really I do. Every time I go to the fabric store I squeeze to the very back with all the big, thick tapestry-type bolts and imagine having rooms full of couches, sofas, and chaise lounges with all of those prints. But the thought never crossed my mind to actually wear them. It's not like the print screams "Young and hip!" and with the way the model is standing, I'm thinking she's more likely to have a hip problem. The black bands across the 'pits make me think of a couch even more, you know, those couches with the leather bands across the base to hold the seams together and make it look not-so-monotonous? It's cute! It's houndstooth! I must admit I was very happy to see that houndstooth is en vogue again, because I've always loved it and it's always in season to me. It also reminds me of the C&R my dad used to get his suits from in the mall, for some weird reason. Anyway, I love coats that are cut in more of a 50s or 60s style but are really timeless, and this is it. I want to buy it and make at least five copies and wear one (maybe more) at all times. So, are we cool Burda? 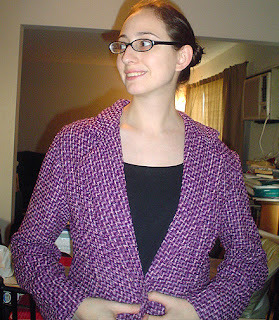 Labels: Burda, coat, covet, jacket, sewing, shove it, what?